Be the first to share your favorite memory, photo or story of Christina . This memorial page is dedicated for family, friends and future generations to celebrate the life of their loved one. 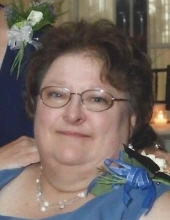 Christina Marie Morris, affectionately known as Tina, 67, was a lifelong area resident of the Hudson Valley. She passed away peacefully, in the company of her daughter, on Friday, April 5, 2019, at Hudson Valley Rehabilitation & Extended Care Center in Highland, New York. Born February 23, 1952 in Poughkeepsie, she was the daughter of the late William J. and Stella Ferenz Hritz. Tina graduated F.D. Roosevelt High School in Hyde Park, class of 1970, and earned an Associate’s Degree from Dutchess Community College.In October 1976, at Regina Coeli Church, she married Richard J. Morris. He predeceased her in 1987. Mrs. Morris worked as a therapy aid at the Hudson River Psychiatric Center alongside her husband, until her retirement in 1988. After which she devoted her time to raising her daughter and caring for family.A communicant of Regina Coeli Church in Hyde Park, she was an active parishioner and school parent; helping to organize countless school events, parties, and carnivals. Tina had many hobbies throughout her life; bowling, golf, snow skiing and travelling. Some of her favorite places to visit were Maine and Lake George, enjoying time at the beach and exploring new places. A love of adventure she made sure to instill in her daughter. Survivors include her daughter and caregiver, Dawn Marie Santiago and husband, Rene, of Hyde Park; cousins, Eileen Swart and husband, Bill, of Newburgh, Dennis Hritz and wife, Katherine, of Poughkeepsie, George Hritz and wife, Mary Beth, of Connecticut, and lifelong friend, Marianne Chupay of Hyde Park. Calling hours will be from 6 to 8 PM, Thursday, April 11that Sweet's Funeral Home, Rte. 9, Hyde Park.A Mass of Christian Burial will be celebrated by Fr. Michael Morris at 10 AM, Friday, April 12that Regina Coeli Church, Rte. 9, Hyde Park. Burial will follow in the family plot at St. Peter's Cemetery, Poughkeepsie. To send an online condolence, or for directions, please visit www.sweetsfuneralhome.com. To plant a tree in memory of Christina Marie Morris, please visit our Tribute Store. "Email Address" would like to share the life celebration of Christina Marie Morris. Click on the "link" to go to share a favorite memory or leave a condolence message for the family.